Have you ever tried to use an iPhone that doesn't have a working home button? For those of you without iPhones, that's the button on the front of your phone that does just about everything. EVERYTHING. Mine decided to stop working a few months ago and because I refuse to pay $100 to get a new one, I'm (im)patiently waiting until January when I am up for a new phone. In the meantime, Apple was smart enough to create a touch screen home button that you can adjust your settings for. It's pretty obnoxious and slow, but it'll do for now (2 months and counting!!!). Thankfully I can still take photos with my phone, or else I might not have made this recipe. My mom pointed it out in her Fitness magazine while I was home and since this is one of the few magazines I don't subscribe to, I snapped a few photos of the recipe. Two days later I found my new favorite dish of the season. 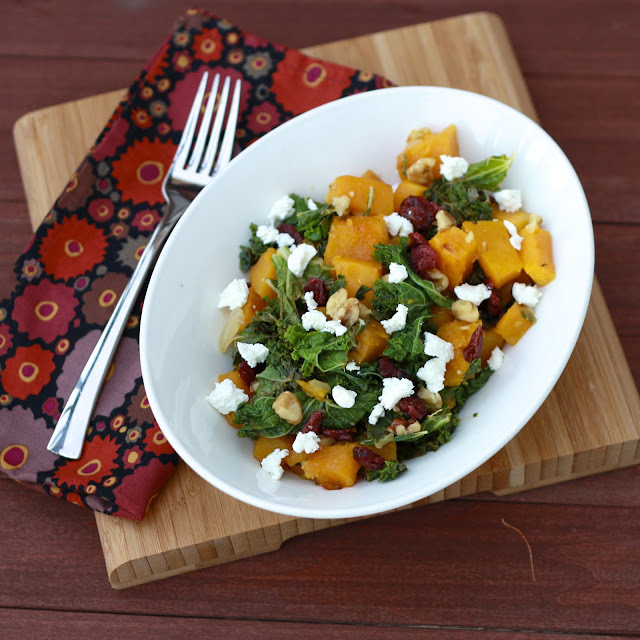 Because you saute the squash instead of roasting it, this dish comes together quickly. The squeeze of lemon juice might seem like a strange addition but I loved the bright flavor it gave the rest of the dish. I made this while Ryan was out of town and was secretly happy I had the leftovers all to myself! That being said, it's one he'll certainly get to try because it definitely isn't a one-and-done recipe! 1. Heat oil in a large skillet over medium-high heat. Add squash, onion, and garlic and cook, stirring constantly, until squash is lightly browned and slightly tender (about 7 minutes). 2. 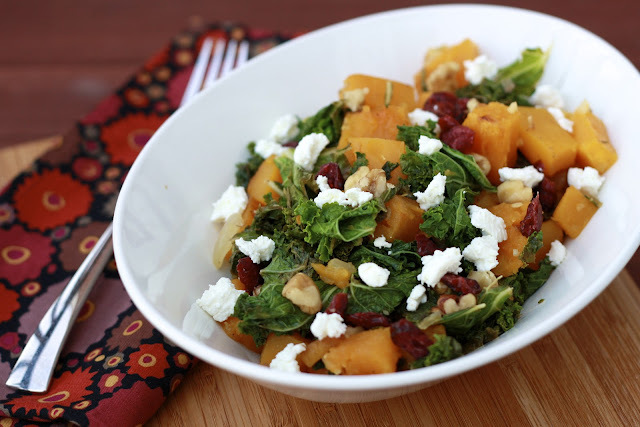 Add kale, lemon zest, lemon juice, salt, and pepper, and cook until kale is wilted and squash is tender (5-7 minutes). Remove from heat. 3. Add cranberries and nuts, tossing to combine. Sprinkle with goat cheese and serve immediately.